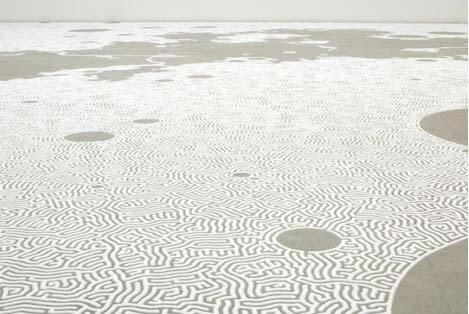 Nathan Spoor interviews Motoi Yamamoto, an artist who creates time consuming yet completely temporary sculptures and installations out of the most unlikely of mediums, salt. One of the more intriguing aspects of the arts is an individual’s decision or dedication to pursue works of impermanence, quite the opposite of usual fare for mass consumption. 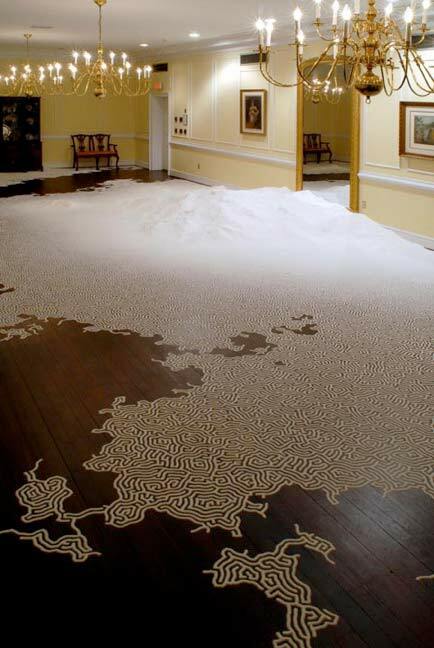 But through the temporary nature of very intricate and time consuming salt constructions, Japanese conceptual artist Motoi Yamamoto brings a very spiritual dimension to his tediously crafted and equally time-specific salt installations. What Motoi Yamamoto brings to each unique exhibiting occasion is his absolute dedication and passion for creating these seemingly futile creations in salt, massive room sized labyrinths that he refers to as “paths with a purpose”. The purpose? To heal himself from the loss of his beloved sister to brain cancer many years back while speaking through a meditative process about the interconnected nature of humanity to the earth. 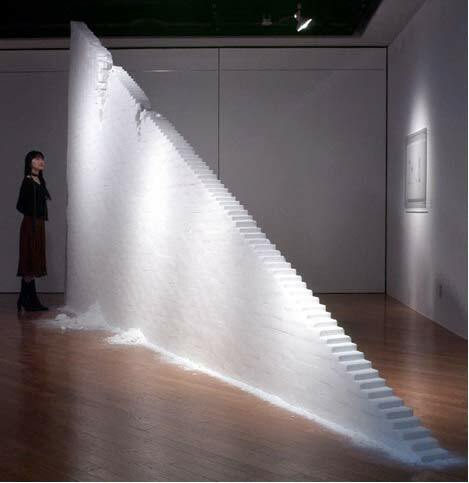 Salt, the focal ingredient for Yamamoto’s work is also a primary focus in Japanese death culture as well as many other cultures around the globe (including Hindu and Roman Catholic religions, as well as Egyptian and Aztec mythology). In Japan’s Shinto religion, salt is used for ritual purification for both physical locations and people. Yamamoto’s salt is often linked to a life giving or even critically sustaining substance for some living creature of the past. He hopes that in viewing his work, the individual may find some point in their meditation for a healing or resolution of thought. 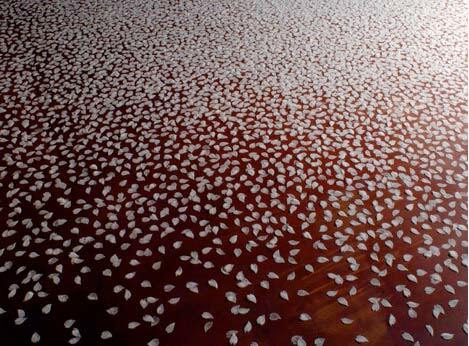 Once the installation is over, the salt will continue on its path, regardless of its tenure in Yamamoto’s service. 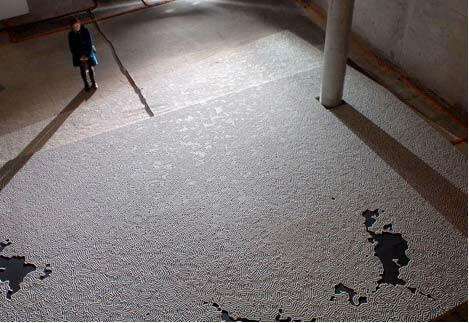 To complete the cycle, the artist asks that the salt from each installation be returned to the ocean. 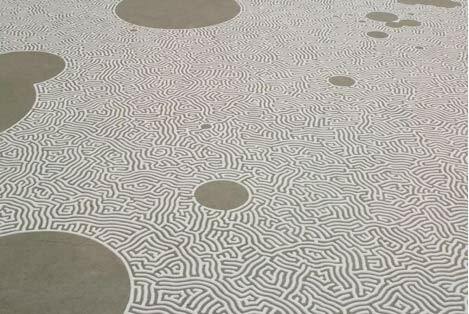 Motoi Yamamoto is an internationally renowned and celebrated artist, who calls his native Japan home. 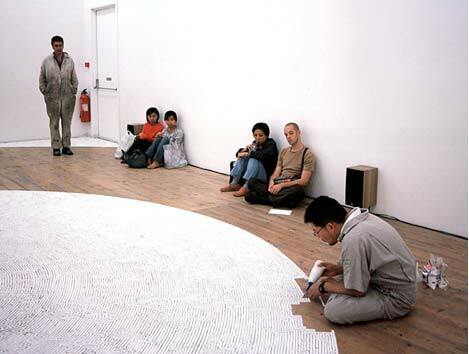 He was born in Onomichi, Hiroshima, Japan in 1966, receiving his BA from Kanazawa College of Art in 1995. He has exhibited his award winning creations across the globe, and garnered the Pollock-Krasner Foundation Grant (2003) as well as the Philip Morris Art Award (2002). 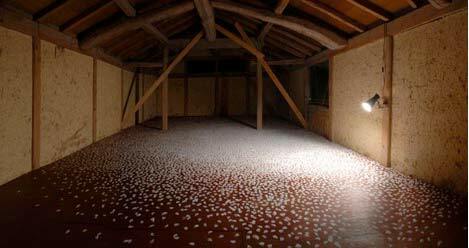 He continues to conceptualize challenging and meditative works from his studio in Kanakawa, Ishikawa, Japan. I see from your biography that you were a dockyard worker until 1988. How did this affect you as an individual, and what did you learn during the process? I learned the essence of the manufacturing process there. Both types of work contain ideas based in patience and continuation. The work is not completed only for an idea. And, the work is not completed only for patience. I always imagined the backside of the wall being a huge iron while I was working in the docks. You have shown your highly conceptual and delicate works throughout the world, while finding what seems to be the most enthusiasm in Japan. How have your experiences in other countries and with other curators or artists affected your thinking or work process, if at all? It is only natural that I have been influenced artistically by having visited a foreign country. I was influenced personally in my thinking as an artist as well as being a foreigner. The biggest influence, for me, is the feeling that a foreign country is the same as Japanese. And it is also important to feel and understand that a foreign country is different from the Japanese. I felt this the most while in Israel somehow. The feeling of this being foreign and also accepted is present in both ways at once there. I think that I am an outsider, and I am at home, too. I have read that you were singularly affected by one particular heart-rending event in 1994, would you be able to tell us how this event affected you, your work and your path in life? The mainspring of my work is derived from the death of my sister from brain cancer at the age of 24 in the winter of 1994. Since then, I have had the dilemma, in grief and surprise, of thinking about what I had and lost. I started making art works that reflected such feelings and continue it as if I were writing a diary. 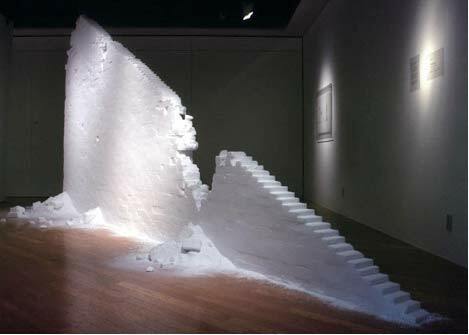 Many of my works take the form of labyrinths with complicated patterns, ruined and abandoned staircases or too narrow life-size tunnels, and all these works are made with salt. A common perception towards them is “nearly reachable, yet not quite” or “nearly conceivable, yet not quite”. Memories seem to change and vanish as time goes by. However, what I sought for was the way in which I could touch a precious moment in my memories that cannot be attainable through pictures or writings. As you approach a new work or concept, how do you begin the journey? I am working out the design of a new concept now. I thought about it in the car today as I drove to the studio. However, it has not yet become real in the physical form. I will try to challenge it into life and realize it in time for a private exhibition in Kyoto for next April. What concept would you say influences the majority of your thought as you prepare for a new concept of work? The concept of zero. I think that death is zero, and that life is one. This moment is surely the sum of this, so I live now. Zero is a moment of the death not death itself. When she died, I felt that something was lost from her body. I expressed life with one and expressed death with zero. I used a number and expressed the moment when life was lost. My thought is very simple, as I am mostly seeking to achieve a moment in which a memory or precious event can be viewed for a short period of time. However, I concentrate most of my power on visualizing it. Salt seems to possess a close relation with human life beyond time and space. Moreover, especially in Japan, it is indispensable in the death culture. After my sister’s death, what I began to do in order to accept this reality was examine how death was dealt with in the present social realm. I posed several related themes for myself such as brain death or terminal medical care and picked related materials accordingly. I then came to choose salt as a material for my work. This was when I started to focus on death customs in Japan. In the beginning, I was interested in the fact that salt is used in funerals or in its subtle transparency. But gradually I came to a point where the salt in my work might have been a part of some creature and supported their lives. Now I believe that salt enfolds the ﾒmemory of livesﾓ. I have thus had a special feeling since I started using it as a material. What does the “Utusemi” work mean to you? Many of my works take the form of labyrinths with complicated patterns, ruined and abandoned staircases or too narrow life-size tunnels, and all these works are made with salt. A common perception towards them is “nearly reachable, yet not quite” or “nearly conceivable, yet not quite”. Memories seem to change and vanish as time goes by. However, what I sought for was the way in which I could touch a precious moment in my memories, which cannot be attained through pictures or writings. 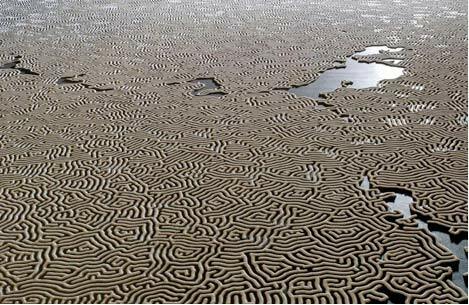 Could you please tell us a little more about these labyrinths? 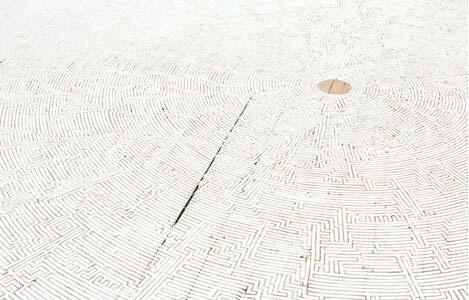 Drawing a labyrinth with salt is like following a trace of my memory. Memories seem to change and vanish as time goes by. However, what I sought for was the way in which I could touch a precious moment in my memories, which cannot be attained through pictures or writings. What I look for at the end of the act of drawing could be a feeling of touching a precious memory. During the course of drawing, I cannot tell it if will reach the essential point till its very end because lines are curved or cut against my intention. It depends not only on my psychological or physical condition, but also on the condition of the floor or the level of humidity. I always silently follow the trace, that is controlled as well as uncontrolled from the start point after I have completed it. In one of the photos of works on your site there is a note that says “after earthquake”. Was that a literal statement or a metaphor for life? It is true. 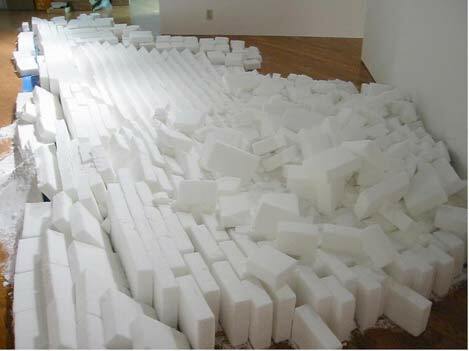 The Fukuoka earthquake of 2005 was generated two days after the opening of the exhibition. 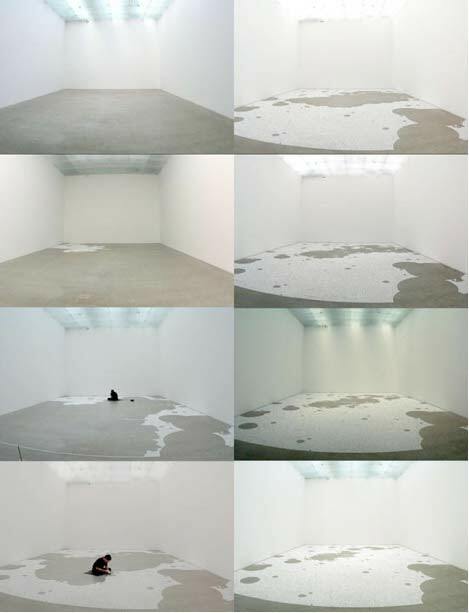 The installation was unsettled and fell to the ground in a disruptive and poetic manner. In 2002 you received the prestigious Philip Morris Art Award, an arts competition for artists based in South East Asian Nations that emphasizes cohesive bodies of work from a singular artist. The following year you received the Pollock-Krasner Foundation, Inc. Grant. How did these impressive achievements affect you and your work? Did these prove to be artistic as well as creative milestones in your career? They gave me confidence and courage. When I was young, I doubted those effects. However, I did not have confidence and I contradicted it. I thank them now for their encouragement and support very sincerely. In your opinion, what is the most powerful or effective instigating factor for creativity and for reaching the viewer? The power comes from a way of life and a heart of people. And, it is a mountain and a brook, the sea and a forest. As we depart from the company of your company, are there any parting thoughts or wishes that you would like to share with the readers and young artists of the world? Teens, please think about only your creative voice. For 2o’s generations, please act for a friend. 30’s generations, please act for the environment of the circumference. 40’s generations, let’s act for a country and the world. And, I think that the artist should have such a freedom as necessary to speak with freedom and passion.